The weather forecast was showers so we all brought along our waterproof’s. They got it wrong, it was wall to wall sunshine and we needed sun cream and sunglasses. We set off from Sam’s pub in Appley Bridge. We got on to the Leeds and Liverpool canal and headed towards Gathurst. On reaching Gathurst railway station we turned right and headed in to Dean Wood. We stopped in Dean wood for our mid- morning stop and on reaching the end of the woods we came to Lafford Lane. Here we turned left off the lane and this brought us to the old priest training college buildings which are now being converted to apartments. We then made our way to Beacon Country Park stopping off at the viewing point which had some spectacular views including the Welsh Hills. We walked through the golf course to our lunch time stop at Ashurst Beacon; again some spectacular views. After lunch we headed west to Dalton Lees passing the site of the old Dalton brick works. We passed The Hanlons which was built in the 1700’s and after passing the farm we headed down to the road. After half a mile we turned right into Blackbird’s farm; from there we headed north over the fields crossing over the River Douglas, the Leeds and Liverpool canal and the railway line. This took us up to the top of Parbold Hill then crossing over the road we headed for High Moor. Upon reaching High Moor we went down another track passing Boar’s Den farm on our right; on arriving back on the main road we crossed over and walked through Fairy Glen which took us back to Appley Bridge and to Sam’s bar for a well earned drink. Thank you to Geoff for some of these photos. Today’s walk started from Leck parish church car park just outside Kirkby Lonsdale. We headed through the hamlet of Ireby and along Maison Gill road before ascending onto the Limestone pavement of North End Scar. After a steep downhill, we crossed the main Ingleton to Dent road to reach the bridge over Kingsdale Beck, before a short steep climb up the flanks of Whernside. The route then headed north to follow the valley of Kingsdale, below George’s and Braida garth limestone scars. We re-crossed dryed up Kingsdale Beck (the stream had gone underground) to arrive at one of the highlights of the day: Yordas Cave. (Yordas was a giant who ate children!) After donning head torches we entered the cool of the cave which contains a spectacular water fall. Now came the hard work! a 320m climb to the ridge that joins the summit of Gragareth (the second highest hill in Lancashire at 627m) to the summit of Green Hill (the highest hill in Lancashire at 628m). We eventually reached the ridge and after lunch we walked to the trig point on Gragareth. Retracing our steps, we continued on our way to climb to the summit of Green Hill, the main objective of the day. After reaching the summit it was onwards to enter the Yorkshire Dales. The route took us to the summit of Great Cowm at 687m and Crag Hill at 682m before a long descent to the Ingleton Climbing club huts and the cavern known as the Bullpot of the Witch’s. village that gave it its name. We arrived back at our cars at 5.15. Tuesday June 12th. Jumbles Evening Stroll. We had a few new walkers in the group, & a few “old”!! familiar faces. We set off from the Jumbles car park to go past the Last Drop Up & over the Turton golf course. Dark skies loomed & rainfall threatened. The path then took us over the railway line then to the Cheetham Arms, no time to stop. On the Wayoh Dam it was sweets & break time, but the midges were out in force so we kept going. Past the Black Bull & down into the Jumbles reservoir path. A final uphill section to finish everyone off nicely timed at 8.55pm. Then off to the pub for an enjoyable drink, five & half miles were covered in total. Well done everyone. 36 degrees Part 5. Leader: John Pickton. Wednesday 20th June. 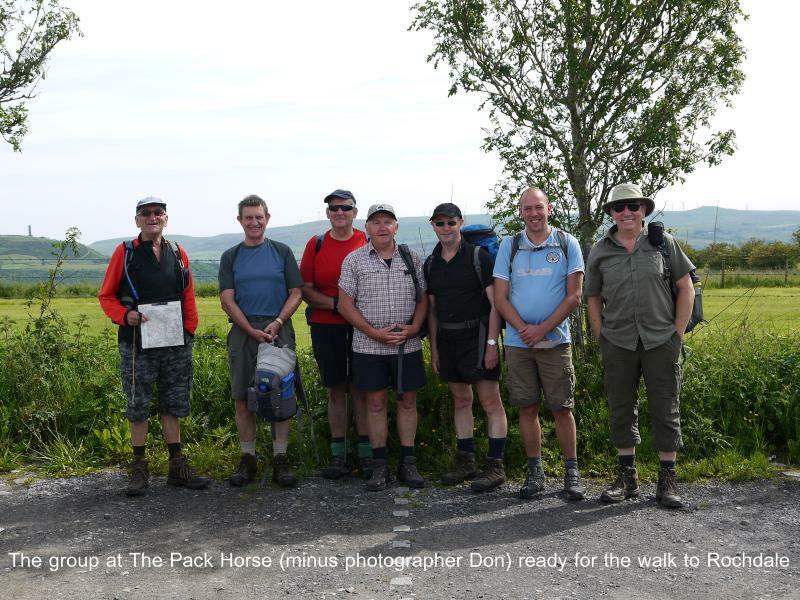 Eight walkers turned up for the walk (Don bringing his Sherpa Alistair along to carry his rucksack). 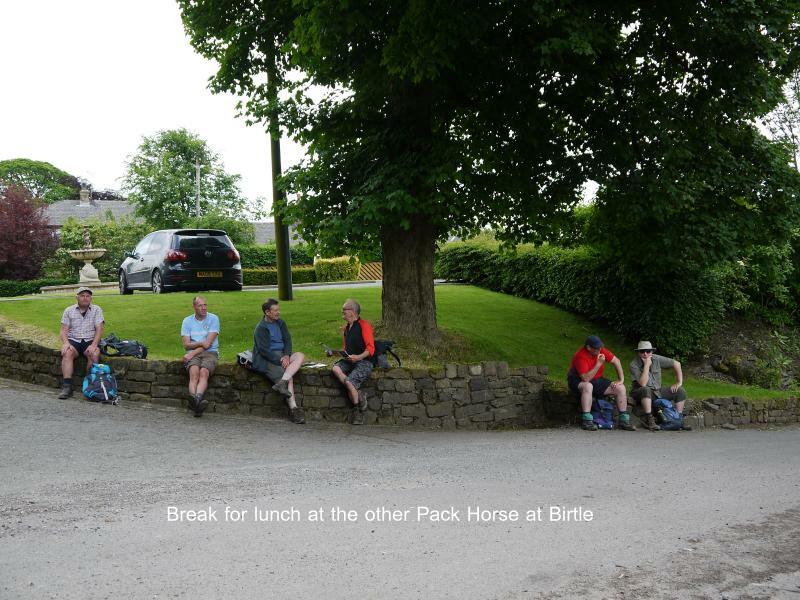 The walk started at the club meeting house (The Pack Horse, Affetside). We were informed immediately that those doing the “reccy” had got lost (misplaced) and that John had done a further reccy to iron out the route. However, this didn’t stop Deputy Leader Norman from leading us slightly astray (nothing new there!) The walk took us through Tottington, which was the only town centre we passed through on what turned out to be a lovely rural walk through a densely populated area, in part using an old disused railway line, a credit to John on his route planning. 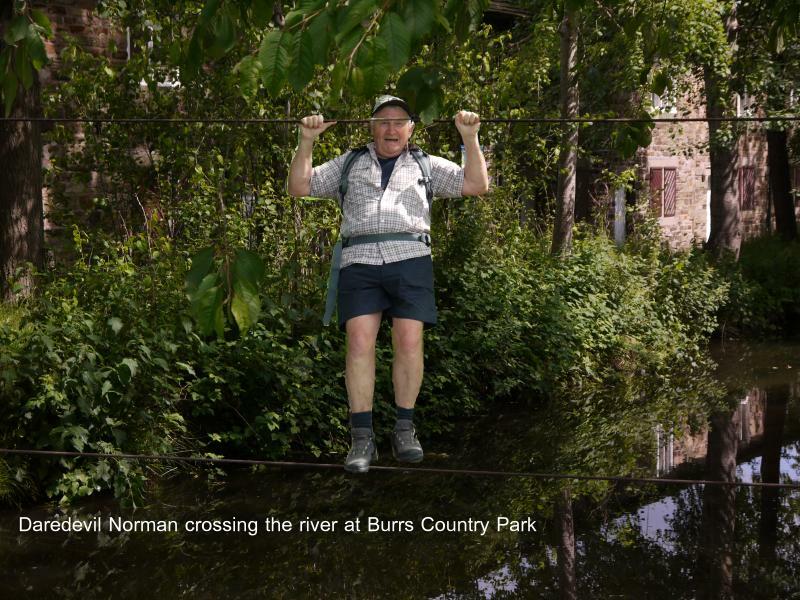 We strolled through Burrs Activity Centre where some children were enjoying traversing across the water on a two rope “bridge” John asked if we could use that instead of the bridge but the activity leader had to give us the thumbs down as we weren’t wearing the correct equipment. This disappointed Elite Plodder Norman who is always game for a laugh. Norman did have one compensation on the walk when he bumped into ex member Mike a man he greatly admired for his map reading skills. Lunch was taken above Birtle village, resisting the call of another Pack Horse public house, before heading towards Ashworth Valley and a pleasant walk through a woodland path. We dropped down to the river Roch going under Queens Park Road bridge and on into Queens Park. We then returned to a riverside walk, finishing on Roch Valley Way, Rochdale. From here it was a return trip in cars to the start for a pint in The Pack Horse. 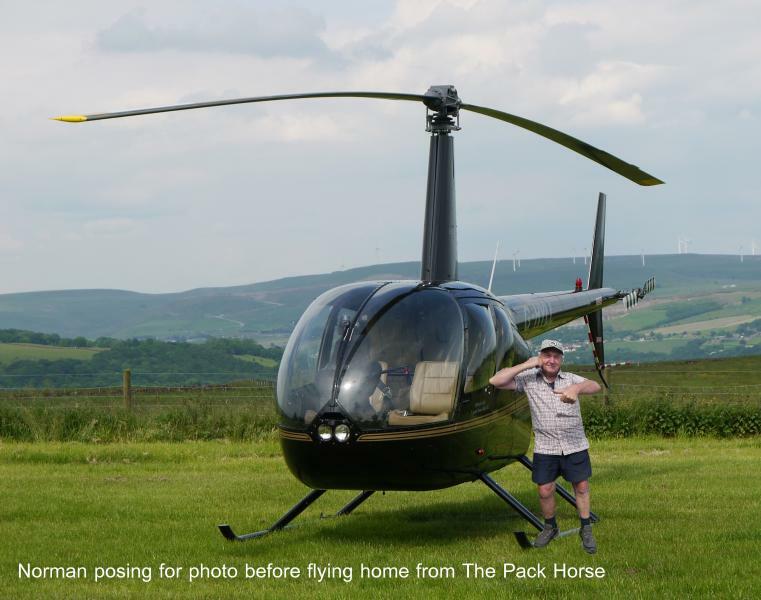 It was noticed on arrival at the Pack Horse that a helicopter was sat outside which we thought was Norman’s transport home, however, when we left the pub the helicopter had left without him. Sunday June 24th. The Long Pub Crawl. 18 miles from Malham. Leader: Geoff Halliwell. 11 walkers and 2 dogs. "Quick, run!!" shouted some. "Quick, hide!!" shouted others, as a late arriving John Bullen attempted to catch us up at the start of the walk. Fortunately, John could run faster, so joining the eleven walkers and two dogs for this quirkily named walk. Geoff explained that the walk was so called because the person devising the route usually liked a pub every few miles, but this one had a gap of nearly ten miles between the pub at Malham and the next one in Arncliffe, hence the long pub crawl. The route set off to Janet`s Foss and then Gordale Scar, both spectacularly affected by recent heavy rain. 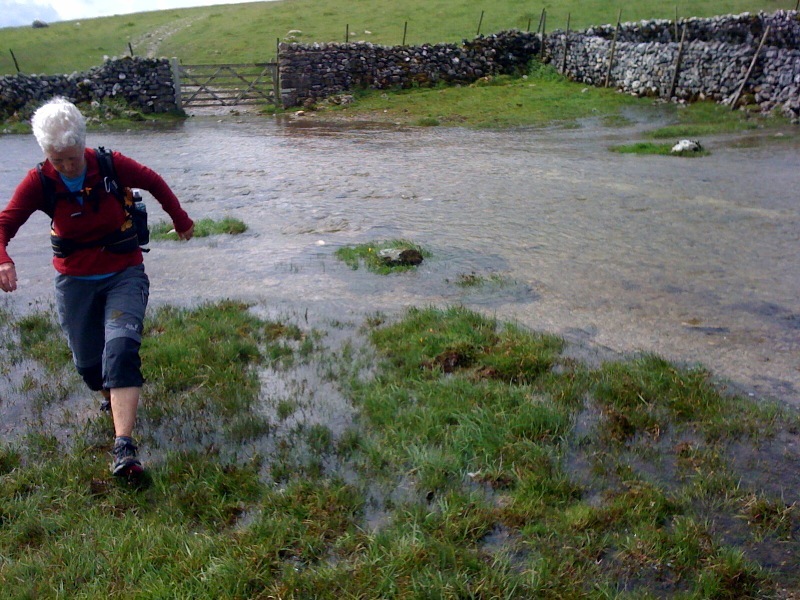 A steep climb followed onto Seaty Hill, before it was shoes and socks off to cross the flooded and aptly named `Mire`. Morning coffee was taken, before the four mile moorland stretch brought us to the beautiful valley of Littondale, with the river Skirfare in full spate. Upon entering the village of Arncliffe, the weather took a turn for the worse, and so lunch was taken outside the Falcon Inn, where the beer is still poured, rather than pumped, straight from the barrel. 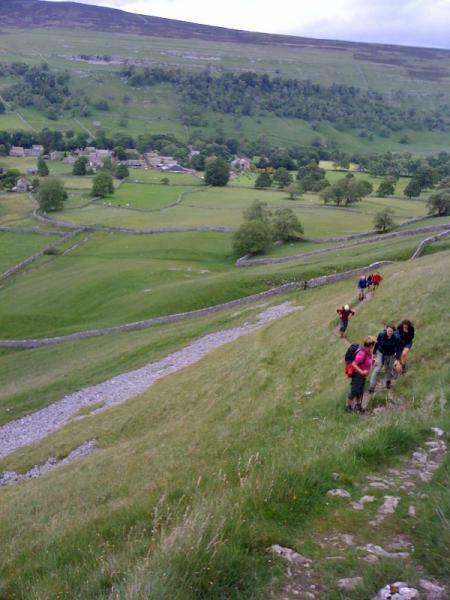 A stiff climb out of Littondale took us south, until we reached the Pennine Way. This took us to Malham Tarn and then into the aptly named `Dry Valley`, where Malham Beck disappears underground, before reappearing at the base of Malham Cove. 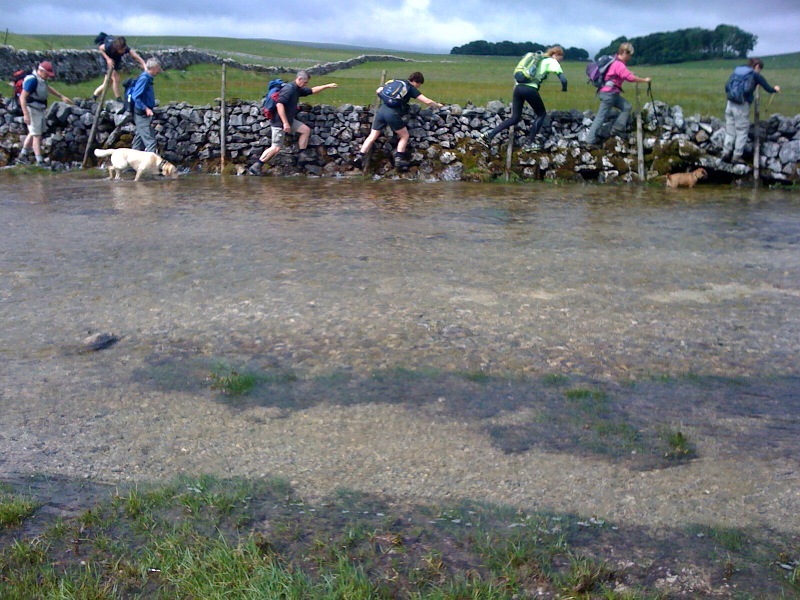 Great care was taken crossing the limestone pavement on top of Malham Cove, before we descended the steps to its base. A short walk returned us to the starting point in Malham, where refreshments were taken, by some, at the excellent Lister Arms. Thank you to Geoff and Andy for the pictures. Tuesday June 26th. Rumworth Rover. 5 mile evening stroll. 11 walkers and 1 dog. Leader: Hilary Scott. The wet afternoon must have put some people off from venturing out, but we were lucky and it stayed dry for the stroll and indeed was quite humid. Leaving the Beaumont Arms we made our way through Ladybridge Estate getting the first glimpse of Rumworth Lodge from here. Cutting through the Britannia Hotel grounds we wondered about the people who came to Bolton on holiday coaches and decided they weren't staying! After crossing the main road we eventually came to the open land behind Hunger Hill; past a field of sheep and lambs and round to some woodland where the front walkers saw a deer disappearing into the trees. Making our way down Lock Lane a test was set for those who knew about the Thirlmere way. Sure enough we found some gates followed by more as we turned towards Lostock. A short break for chocolate bars and over to the end of Rumworth Lodge which was very still in the evening light. Making our way down to the Middlebrook path there was evidence of the high waters of the previous weekend with lifted tarmac and general debris on the river banks. Up through Ladybridge Lane and we were back at the Beaumont Arms just before 9pm. Several of us had a quick drink before returning home. Thanks to all who came.